Private garden entrance, private bath, quaint, quiet, pets welcome. Please inquire for actual availability. Renting short term (< 30 days) in Las Vegas has been recently complicated by statues undergoing revisions that are not favorable. I am renting on a monthly basis. You don't have to stay here the whole month, but since I can only rent to one party every 31 days, the rental rate is a flat $950. Thank you for understanding. I'm happy to work with you on your request but you must inquire before requesting a reservation based on the calendar availability shown. Come stay with us at our Mini Ranch/Hobby Farm just 5 minutes from Centennial Hills Hospital. Our large, private master suite is yours to enjoy and that includes a distant view of The Strip, Downtown, and two mountain ranges. You access the room from the outside only, not through the home. Outside your door is a small patio with BBQ and table where you can enjoy your morning coffee, watch the sunrise and visit some of our animals. Behind the low fence there are chickens, geese, goats, a horse, and assorted wildlife that appear sometimes. We've seen roadrunners, hawks, coyotes, lizards, squirrels, quail, cottontails, and vultures, to name just a few. You are welcome to bring your pets, even horses. Our almost-rural neighborhood is a great place to walk and ride. Our dogs and cats may be on the people side of the fence, but are content to stay out of your way most of the time. They do not have access to your room. Our spacious offering features a bay window with seating and table, a Queen Temper-Pedic bed (med-firm), a walk in closet, and a generous 4 piece full bathroom. There is a limited 'efficiency kitchen' with microwave, coffee maker, toaster, and 3 cu ft refrigerator. There's no oven, but I provide an electric skillet. Dish washing is limited. I recommend disposables but provide plates, bowls, cups, flatware, and ceramic mugs, and also coffee. Best suited for snacks, drinks, and breakfast, there are dozens of restaurants within 5 minutes. You'll find a vaguely modern western decor with brown, blue, and rose colors. You have your own thermostat controls and ceiling fan for your comfort. Two windows open for fresh air if you prefer. The closet is roomy enough for a long stay. The dresser is casual and makes use of the bookcase and canvas drawers; also contains books and games as well. We are about 20 minutes from The Strip and Convention Center, 25 minutes to McCarren, and 5 minutes to Centennial Hills Hospital and the Northwest Transportation Hub, which takes riders all over via express buses, including UNLV and the airport, although this is not a particularly convenient travel option except on New Year's Eve. We provide all linens, have laundry facilities available, even vintage games and puzzles if you need some down time after a hard day (or night). Flat screen TV has remote and DirecTV. There is an additional cleaning fee per booking if you bring any animals. We live on-site and are available to help you with questions or travel information. We are an alternative to the normal "Vegas", a great place to stay if you're visiting friends or don't want the casino scene. NO firearms allowed. NO smoking / burning indoors. NO Exceptions. We moved to Las Vegas in 2003 and found a great property with a bigger-than-we-needed house on it. Our extra room has allowed us to host students from Netherlands, Denmark, and Germany, save a friend from homelessness after foreclosure, give a wayward friend a flop, and keep costs down for travelling friends and relatives. We've enjoyed meeting people and sharing our little secret of Las Vegas - that 2,000,000 people live here, we're not all on The Strip, and that there's a rural community on the edge of town. Mike is the head of the household and is a software engineer. He works at home, but also travels a lot all over the world, having been to Europe, Africa, The Middle East, and The Himalayas. Holly, your hostess, is a licensed veterinary technician but finds the demands of a clinic too exhausting. She is also a published science fiction author and is happy to sign a copy of her book (s) for you. A former career as a resort manager assures you of a quality stay. Mitchell is our son; he is 17. He was the first chair bassoonist at his school, an advancing orange belt in martial arts, and a computer whiz as well. He is planning to go into aeronautical engineering after high school. He sometimes helps with preparing your accommodations here to earn money for that college education. We were all born in California, and still have extended family there spread out between Los Angeles and San Diego. Being in Las Vegas we enjoy more sunny days and sometimes snow in the winter, right in our yard. We have invested in a solar array that powers our entire home with renewable energy, and we're pretty happy about that from an ecological standpoint as well as a financial one. It gets tough in the summer with the A/C running, but is no longer $400! PLEASE contact us with an inquiry for availability. Inconsiderate renters have left an ugly taste in the mouth of the City Council, and restrictions are mounting. Zoning requirements demand we rent to only one party in a 30 day period. If this seems outrageous to you, I encourage you to inform the Las Vegas City Council of your concerns. You may email Mayor Goodman at CGoodman@LasVegasNevada.gov You might want to stay with us if you are on a budget and need some quiet time for your stay, or would like to visit friends or family. Are you a travel nurse or intern at Centennial Hills Hospital? We are a bike ride or 5 minute car trip away. Las Vegas is a sprawling city on 600 square miles with over 2,000,000 residents, and The Strip is simply the focus. From our place you get the safety of the community, a new perspective on the city, and local taverns for a little night life without the overwhelming 'everythingness' of the city. We love our ability to have farm animals but also live close to shopping and can access the action easily. Visiting friends and relatives? Military send off or welcome? Indian Springs and Nellis AFB are less than an hour away. Want to spend the holidays in the snow? We're 30 minutes from darn good skiing and snowboarding. Like a little wilderness? Just 15 minutes to Red Rock Canyon National Conservation Park. And if you really want a taste of The Strip, it's a quick 25 minute drive to Mandalay Bay, or a 20 minute drive to the Old Town and Fremont Street. You can bring your pets here - even your horses! At night watch the lights come up. See the Luxor beam, the High Roller Linq, Wynn and Encore; look up and watch satellites if the moon is new. We are not 'Vegas' - we are home near schools, churches, and regular people. Come stay with us and earn your 'LOCAL' wings! Large four piece private bathroom with extra long bath tub and shower over tub. Extended counter top with make-up area, wall length mirror. There's an unobstructed view of The Strip and Downtown from Fremont Street to Mandalay Bay. The lights are wonderful, the day view can be spectacular, see the High Roller, Stratosphere, the Luxor. It's not the corn fields of Iowa, but there are no sidewalks, streetlights, or any properties less than 1/2 an acre. The fringes of The Burbs. Quiet neighbors, farm animals on site including roosters. To the north are the Sheep Range, the west are the Spring Mountains, the east is Sunrise and Frenchman. When they are snow covered they are breathtaking, unusual and exotic when dry. Yes, and you have control over the setting, central A/C. Setting restricted to maximum low of 74 F May through September. Yes, and you have control over the setting, central heat. Setting restricted to maximum high of 74 F please. You are provided with clean linens and one spare set. Linens are changed once a week and between guests. Please ask about using the washer. We will show you how. Please ask about using the dryer. We will show you how. Clothesline also available anytime. Free Wi Fi, the network and password are in your room. Lots of towels available in various sizes and colors. OUTDOORS we have a portable fire pit you may use if it is not too windy! Nice ambiance. Medium-Mini size with freezer shelf. Great for customary instant food items, heating water, not for turkeys or casseroles. Two slicer at your service. Coffee and tea, sugar and sweetener, half and half. Paper towels, paper napkins, coffee filters, salt and pepper. We welcome any condiments you want to contribute the community chest. Heavy plastic and disposable plates, bowls and flatware except mugs - I provide china. No one wants coffee in Styrofoam. Do you really want to watch tv while you're here? We have a large television in your room, and DirecTV service. All kinds of paperbacks you are welcome to read while you're here. Mostly non-fiction but some novels. Owner's novels available to read, purchase, or ignore. We have trees, grass, shade, chairs, you are free to use the yard. Beware of lawn mower geese. They think it's their yard and will tell you so, but not (usually) bite. There are not many places to bicycle TO but if you want to toodle around for exercise in the morning we have an adult bikes and one teen size. Private morning space, and you may use the patio space in front of your bedroom window if you won't mind occasional company. Hammock available, table and umbrella available if it's not windy. Just 30 minutes up the road. They start making snow in November if nature doesn't provide. 4-5 star rated course on Trip Advisor, just 3 miles to the east. Is not a beginner's course, I hear it is well maintained. Is a local resident club, not a lot of tourists. We have a large above ground pool open only from June through August. Stay with us if you want the option of 'Las Vegas' but prefer a private, less chaotic place to stay or would like to enjoy some rural home life with farm animals. Dogs always included. This is an awesome place to stay in a perfect location for my purposes. The whole experience was first class. The accommodations, the people (Mike and Holly) but most especially Cowboy and Taffy make this an awesome experience. We’re so glad your stay was a great one! The dogs miss your attention. Hope to see you again next year. We enjoy having you here. We are so grateful to have had the opportunity for a 7-week stay at this property. This wonderful couple made us feel welcome from the beginning, and assured that we had everything we needed throughout our time there. The neighborhood was quiet and surrounded with lovely mountain and desert scenery. 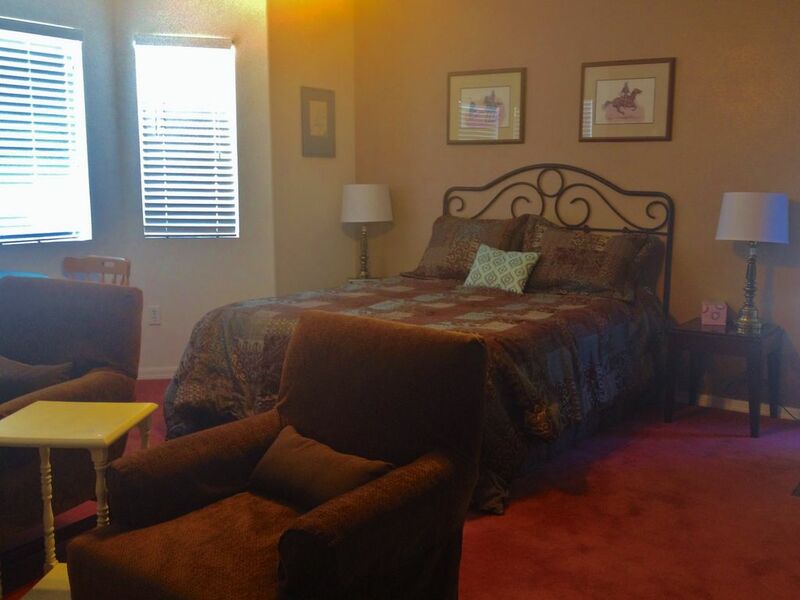 The property was very clean and the bed was super comfortable, providing us with uninterrupted sleep every night. Along with the huge bathroom and large walk-in closet, coffee was always there for us as well as a small refrigerator, microwave, electric frying pan, and even treats for our two dogs. We were free to enjoy the expansive back yard with sitting area, outdoor grill and hammock nearby, or to roam further to experience their gentle horse and other animals that are a delightful part of their home. With all this, we still felt that our privacy was very much respected and were able to come and go as we pleased. The owner of this property is a published author of at least four books, and we believe #5 is on the way. Upon arrival, we were given a copy of the first one as a gift to enjoy during our extended stay. We did so, and had a hard time putting it down. Luckily, we found her second book on the shelf with other reading materials and games that had been provided. That one was equally as captivating as the first. And now we are back home, continuing to be intrigued with #3, looking forward to what the fourth will bring, and hoping very much to return to this same property again next year. The pleasure was ours, and we look forward to seeing you both, and Fuji and Snickers too, next year. Thank you for the lovely words and I'm delighted to have made a new fan! I really enjoyed my stay at Holly and Mike's studio, it was very comfortable and clean. It's in a very quiet location away from the madness of the strip. I enjoyed watching all of the animal antics and especially spending time with the two adorable dogs who came to welcome me home every time I returned. The view of the lights on the strip at night were amazing. Did not find fault with anything during my stay. Definitely be returning. Thank you Holly and Mike for your hospitality and great communication. We enjoyed having you! Look forward to your next visit when you're in Vegas again. If you are looking for a home away from home this is your place. Cozy get away off the beaten path with hands down the best night view of the strip in Vegas. Loved being greeted each morning by Cowboy and Taffy the resident dogs. Our fur babies loved being on the farm with plenty of room to explore. This was our second visit. My grandson and I had a great time...especially feeding the goats and horse carrots and the dogs Cowboy and Taffy dog treats. Holly is a great host. Bed is comfortable and the rollaway was perfect for my grandson. Especially like the tub, great for soaking and it is an oversized tub, so grandson had is own personal "pool". Come see us again, you're always welcome! My wife and I really enjoyed staying in this cute little ranch outside of Las Vegas. The hosts were very gracious and friendly. The only reason I didn't give it 5 stars was that their dogs didn't seem to warm up to us too well and always barked at us when we came and went from the property. Thanks for the kind words. I'm sorry the dogs weren't quieter during your comings and goings. They do the same thing to us, I'm afraid, in their excitement to say hello. We are a great place to stay if you are visiting someone at Centennial Hills Hospital, want to be closer to the Ski and Snowboard resort, or need an affordable place because your friend is getting married and don't mind a little extra driving. All within an hour's drive you can visit State Parks, National Parks, Recreation Areas, Hoover Dam, see the Atomic History Museum, Natural History Museum, the Springs Preserve, and Floyd Lamb State park where people would spend 6 weeks to establish residency to get a divorce in the early 20th century. Shooting - one of the best shooting ranges in the west can be found about 10 miles east of us. Programs and lessons available (even a snack bar). We are always about 5% cooler than The Strip because we are 30% higher elevation. Give us better views and weather. Riding your horse locally or passing through? We can accommodate 2 horses for you; bring your own hay. You can ride out from our property to MILES of mountain trails, or trailer a short distance to MORE trails in the foothills. Ride at Red Rock, Valley of Fire, Mount Charleston. Just one of you and a horse? I'd love to ride with you!